2mm, 3mm, 4mm, 5mm and 6mm are all safe to fire in metal clay. Emerald Green Cubic Zirconia has been replaced by Nano green gemstone. Metal clay test results, Silver 1200F-1HR, Silver 1475F-1HR, Bronze 1525F-2HR, Copper 1778F-30min. Safe to use torch and safe to use carbon. All other sizes Emerald Green Cubic Zirconia (May) is not safe to fire. January--garnet; lab-created corundum, safe to cast in place, Safe to fire in metal clay. February - amethyst; cubic zirconia, safe to fire in metal clay and safe to cast in place. March - aquamarine; lab-created spinel, Safe to fire in metal clay and safe to cast in place. April - Diamond; Safe to fire in metal clay and safe to cast in place. July - ruby; lab-created corundum, safe to cast in place, safe to fire in metal clay. August - peridot; cubic zirconia, safe to fire in metal clay and safe to cast in place. September - sapphire; lab-created spinel, Safe to fire in metal clay and safe to cast in place. October - tourmaline; cubic zirconia, safe to fire in metal clay and safe to cast in place. November - topaz; cubic zirconia, safe to fire in metal clay and safe to cast in place. 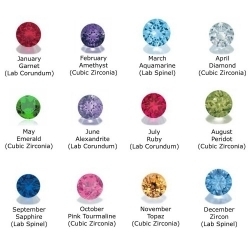 December - blue zircon; lab-created spinel, Safe to fire in metal clay and safe to cast in place.